I have had facial hair since I was 13-years-old. The density and darkness may vary week to week or month to month. Although these pictures make my skin look tan and yellow, I actually have very pale white skin with thick brown/black coarse hair. I often get ingrown hairs in my bikini area. I shave my underarms everyday, sometimes twice. As you can see the hair is visible, even directly after shaving. 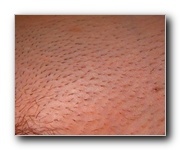 These photos were taken at the laser hair removal center minutes after my first treatment. As you can see there is no redness or swelling of the skin. 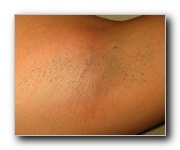 I had my first signs of shedding eight days after the first laser hair removal treatment. My skin was a little irritated during this phase. The first picture shows the odd patch that was missed during my first treatment. I haven't shaved my bikini area up to this point, as you can see almost all of the hair has fallen out. I still have the same ingrown hair that I had before the first treatment, but it is starting to go away. I continued to shave my underarms everyday, until now. If you compare these photos to the ones before the first treatment you can see the area looks smoother. These pictures were taken almost two months after the first treatment. The hair is long and grows rapidly. It is a little thinner than before the first treatment. My underarms are a little easier to shave, but they still require shaving everyday.